Martyn Brown at High Woodale Farm in Nidderdale. Credit: Yorkshire Water. Over 10,000 trees have been planted at High Woodale Farm in Upper Nidderdale to boost wildlife habitat as part of a wider target for Yorkshire Water to plant one million trees on its land. The new trees, covering 11 hectares of land, will provide habitat for birds such as ring ouzel, cuckoo, and spotted flycatcher. The woodland will also provide winter food and shelter for black grouse, successfully reintroduced into the area by the Game & Wildlife Conservation Trust. Experienced farmer Martyn Brown has managed High Woodale Farm, a 970-hectare upland farm, since 2002 and is working to make it a sustainable farm for the future that increases wildlife habitat. Planting was carried out by the Upper Nidderdale Landscape Partnership, which is supported by the Heritage Lottery Fund, in partnership with landowner, Yorkshire Water. The work is part of a pioneering vision, ‘Beyond Nature’ which aims to transform how farms in the future connect with the land, water and wildlife around them. All the newly planted woodland will be visible to walkers from Scar House reservoir. Lisa Harrowsmith, a Lead Surveyor at Yorkshire Water, said: “Part of our vision is to inspire people to enjoy, appreciate and care for Nidderdale’s stunning landscape and its nationally important wildlife. 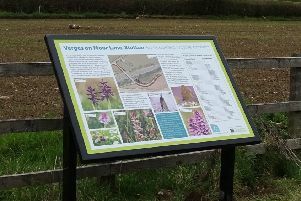 Organisations involved in transforming the land include Yorkshire Dales Millennium Trust, Harrogate Rotary Club, and the Woodland Trust, organised by Tara Challoner, Upper Nidderdale Wildlife and Farming Project Officer. All the trees are native species made up mostly of birch, oak, hawthorn, rowan, bird cherry, holly, with some gorse and Scots pine. As well as the tree planting, a range of wider biodiversity and cultural works are being carried out at the farm. This includes the creation of 50 wet scrapes to benefit breeding wader birds, and the restoration of an historic hay meadow for grazing cattle.